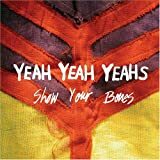 With "indie" bands popping up like Clay Aiken's boxer shorts in a men's locker room, it's hard for a band like The Yeah Yeah Yeahs to stick out from the crowd. Their previous record was good, but three years down the road there a countless bands who sound similar. That's way 2006's Show Your Bones is so excellent. It's full of introspection and gifted songwriting. "Gold Lion" has to be one of the catchiest singles of the year, and the rest of the album offers more of the same. With boring bands like Morningwood and Metric popping up every day, it's nice to hear someone can still keep the indie genre fresh and edgy.